Everybody in Newark has heard of Raymond Boulevard, but do you know that it is named for Thomas Lynch Raymond, a three-time mayor, a Renaissance man in every good sense of the term and a person as basic to Newark as Plymouth Rock is to America? Raymond was born in East Orange on April 26, 1875, the son of Thomas Lynch Sr. and Eugenia (Launitz) Raymond. His father was descended from 17th-century Connecticut stock, as were many Newarkers of that era. His mother proudly proclaimed her solid Russian and French artistic background. Thomas Sr. was president of New York City’s Produce National Exchange Bank. Eugenia not only kept the Raymond household in order but showed her interest for artistic and intellectual pursuit. The future mayor was educated at East Orange’s Ashland Public School, Trinity College School in Port Hope, Ontario, Canada, and Newark Academy. At 17, he read law and entered Columbia Law School where he earned his law degree. In 1903, he entered general practice with Andrew Van Blarcom. In 1908, Raymond helped form the firm of Raymond, Mountain, Van Blarcom, and Marsh. Later the same year the Republican was appointed assistant prosecutor of Essex County. In 1915, he successfully ran against and defeated Mayor Jacob Haussling. In 1916, he was reelected mayor. His tenure the second time lasted for only a year after defeating Haussling and Charles Gillen by more than 12,000 votes. By 1917, Newark’s new government brought him back as a Republican commissioner amid a sea of Democrats. In his new position, he was chosen as director of Streets and Public Improvements. It was in this office that he made many lasting changes in Newark’s physical appearance and was largely responsible for transforming the city from its boomtown images into that of an important urban center. In 1921, he was reelected to the public improvements position. 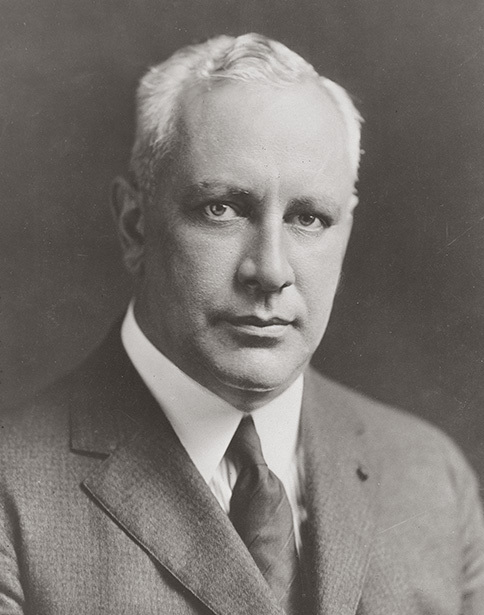 Four years later he was chosen to serve as mayor once more, a position he held until his untimely death in 1928 upon the eve of his most important accomplishment—the completion of Newark Airport, the busiest in the nation during the 1920s and ‘30s. During his lifetime, Raymond lived downtown at his Kinney Street home, kept a hideaway in Greenwich Village, and often sought solace in his house at Washington Valley, near Mendham, where he spent hours in his self-designed English country garden. In his garden, which was filled with roses, delphinium, phlox and daisies, he made many of his most difficult political decisions and resolved many dilemmas. Raymond was a remarkable man—a charter member of the Carteret Book Club, a close circle of serious book collectors, author of a study on Stephen Crane, maker of miniature cardboard models of cathedrals and religious shrines, and was active in many literary, historical, and genealogical organizations. His rare book collection, sold at New York’s Anderson Galleries after his death, included fine editions and valuable reprints of works of Malory, Chaucer, Burne-Jones, Crane, Henry James, Bruce Rogers, and Oscar Wilde. Raymond’s death brought the city into a period of mourning. The funeral was held in Trinity Cathedral. Jerome Congleton, his successor, described him as the 'ablest in a long line of great mayors'. His fitting memorial was a window in Grace Church where he was a vestryman and warden for many years, 'for faithfully serving God'. Thomas Lynch Raymond's contributions, ideas borne of a complex personality, truly made him Newark's first Renaissance mayor. On one hand, he was a skilled politician, as shrewd and clever as anyone who had ever held the reins of power in Newark City Hall. He was a strong-willed individual who saw the city's future as a regional center for any number of diverse activities in northern New Jersey. But Raymond was also an innovator, not simply a dreamer. In his lifetime, he originated, cultivated and recycled others' ideas in his own way to build a city that far outstripped its boundaries. He was an intellectual who moved among the educated elite of his hometown, state and beyond. During Raymond's political life as commissioner and mayor, he was engaged in four gigantic projects that were to change the face of Newark forever. These included the development and expansion of the port, airport, water supply and the rebuilding of its most important downtown railway station. In World War I, the city's port had come under the management of the federal government. After the war, Raymond wanted it back for Newark. He was determined that it would become part of Newark's future development. In competition with New York City, the Newark mayor showed that his city could bring the railhead right to the edge of the seaport, an impossibility for the island of Manhattan. Today, the beauty of Newark's transportation network lies in the mingling of port, rail, auto, trucking and air traffic. To some New Yorkers and Newarkers at the time, upstart Newark was on its way to stealing some of the region's transportation thunder. From Newark's earliest history, the port area and Ironbound often were considered simply a mosquito breeding ground, a valuable asset in colonial days, for the harvesting of salt hay on farms. The area held potential, for it was both within minutes of downtown Newark and the spoke of the region's transportation hub. Today, it is one of the most valuable real estate holdings in the country. With proper handling, it has made Newark a thriving city. As Raymond saw it, '… the west side of the Hudson River is destined to become the center of the greatest population of the world.' Within several years a great port facility emerged, one that has been built and rebuilt to accommodate the demands of the growing region, first by the city and then by the Port Authority of New York and New Jersey. Land that Raymond once thought best developed for industrial purposes eventually was incorporated into the airport. Following Charles Lindbergh's successful Paris flight, Raymond pushed hard for the Newark Air Field Plan before the Hoover Fact Finding Committee surveyed the region. Although the Newark site was a low priority, the Port Newark area was eventually selected. With Raymond eager to see the airport 'working on a larger scale' in his own back yard, Newark, within a few years, became the most important airport on America's Atlantic Coast as well as the East Coast terminus for airmail. Newark International Airport – stimulated by Raymond, built and developed by the City of Newark, and later rebuilt and developed by the Port Authority of New York and New Jersey—has become one of the world's busiest transportation facilities. Water and railroad systems Raymond's third project was the extension of the city's water supply system. Under an earlier mayor and council, Newark already possessed one of the country's best water supply systems. However, as it expanded, the resource needed updating. As a member of the North Jersey District Water Supply Commission from 1922-28, Raymond pushed the Wanaque Project, one of the state's greatest engineering projects. In 1920, ground was broken for a massive reservoir that would hold 50 million gallons. A dam 1,500 feet long with seven secondary dams was constructed, its surface covering 2,300 acres. More than 80,000 cubic yards of concrete was used at a cost in excess of $30 million. Raymond also sponsored the rebuilding of the Pennsylvania Railroad Station, the third building to occupy the present site since the mid-19th century. In 1923, Raymond learned that the railroad was planning to construct a new terminal in the meadows, then persuaded company officials that it would be better to rebuild it in downtown Newark. After a year's negotiations, the present site was purchased, including the bed of the old Morris Canal, for $425,000. Public Service Coordinated Transport agreed to develop trolley service, and the railroad agreed to develop the station that stands today amid Newark's expanding office center. The result was a $20 million art deco building with railroad, trolley and bus connections extending far into the New Jersey hinterlands. In the 1990s, NJ Transit moved its statewide operations to an adjoining office site. Penn Station is undergoing a massive redevelopment and facelift. It remains the busiest rail station in New Jersey. In reviewing the former mayor's outlook on Newark and its relationship to New York, his motives were clear: develop Newark as the most important city in New Jersey and exploit it as far as possible as the hub of activities for the state. More than a half-century earlier, New York City annexed Brooklyn, the nation's fourth-largest city. Newark was busy adding Vailsburg and Clinton Township and adjusting its Elizabeth boundary. What about taking back the Oranges, Montclair and all other western communities of Essex and lands to the west that had originally been part of Newark Township at the time of the Revolution? Arguments like this made sense to many Newarkers and non-Newarkers who wanted to use Newark's education, water and sewer facilities. Imagine! What if our boundaries were 250 instead of 23 square miles? What if we had a million rather than a quarter million residents? That didn't happen. Raymond's death in 1928, and foremost, the economic ruptures of the 1929 Depression ended any such imperial dream once and for all.